Untangling a necklace can be very frustrating. This is a guide about how to untangle a necklace. 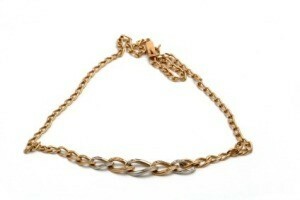 Moisten a tangled neck chain with vegetable oil before trying to untangle it with two straight pins. I need a tip on how to untangle a necklace chain. Thanks. Put a paper towel on the counter. Put the necklace on top of that. Get two straight pins. Put a drop of oil on the knot. The oil will loosen the knot. The paper towel will absorb the excess oil. Use the two pins to untie the knot. This works for me every time, even with very fine chains. I usually open the clasp so there are 'two ends', then spread the tangled chain out on the kitchen table (or worktop counter) as far as I can. I carefully widen the spread using a toothpick or icepick tip. Then, when I've spread it enough to see the direction the tangle is going, I use a combination of slant-tip tweezers and the toothpick or icepick to work the tangle out. I've taped one or both of the opened clasp ends to keep them under control, lifting the tape only when I'm sure I know what direction to pass it through-under-over to clear the tangle. It also helps to put a little cornstarch or baby powder on the tangle and rub a bit between your thumb and forefinger. This usually loosens the tangle where it can be undone. I would like to know how to get the kink out of a necklace. Try placing the necklace on a flat hard surface, then gently roll over it with a rolling pin. If it's a Herringbone type, it can be hard. If you have a pair of jewelers pliers (or pliers with smooth jaws), try to flatten the kinked part between the jaws, with light pressure. If it's a link/mesh type, gently manipulate the area till it lies flat. Other than that, if it's a good piece of jewelry, you will have to see a jeweler. If this is a fine chain, try using two straight pins to slowly work them out.